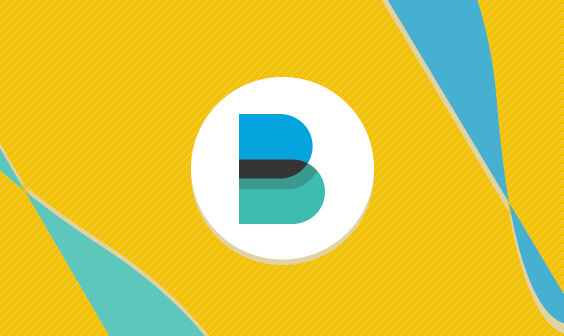 In the next couple of weeks, we will start to take a closer look at some of the new features. 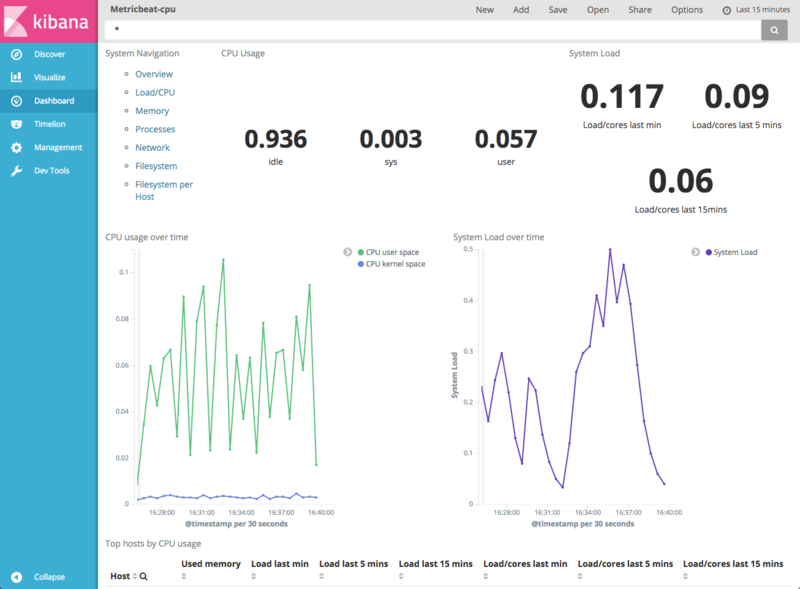 Since I’ve already covered a number of ways to monitor system metrics with ELK, I wanted to begin with trying out Metricbeat — a revamped version of Topbeat. 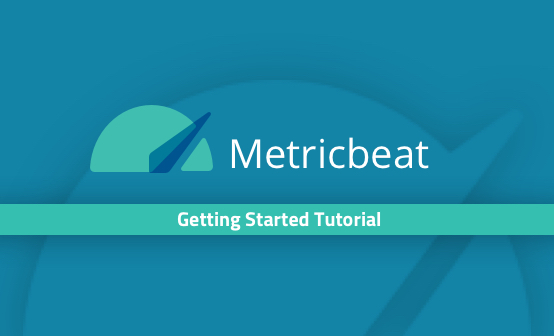 As its name implies, Metricbeat collects a variety of metrics from your server (i.e., operating system and services) and ships them to an output destination of your choice. These destinations can be ELK components such as Elasticsearch or Logstash or other data processing platforms such as Redis or Kafka. We’ll start by installing the components we’re going to use to construct the logging pipeline — Elasticsearch to store and index the data, Metricbeat to collect and forward the metrics, and Kibana to analyze them (Logstash has begun its retreat from the stack, something we will discuss in a future article). Our final installation step is installing Metricbeat. 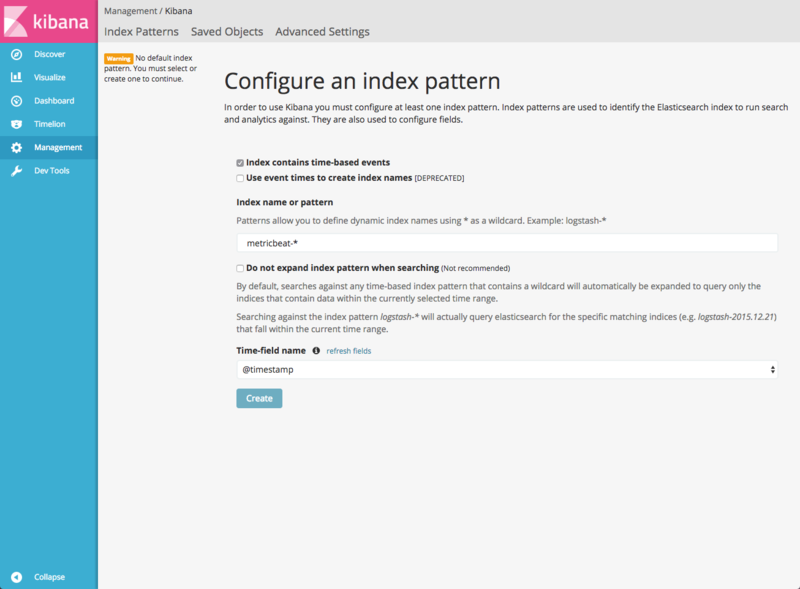 To do this, you will first need to download and install the Elasticsearch public signing key. Now that we’ve got all the components in place, it’s time to build the pipeline. So our next step involves configuring Metricbeat — defining what data to collect and where to ship it to. Open the configuration file at /etc/metricbeat/metricbeat.yml. 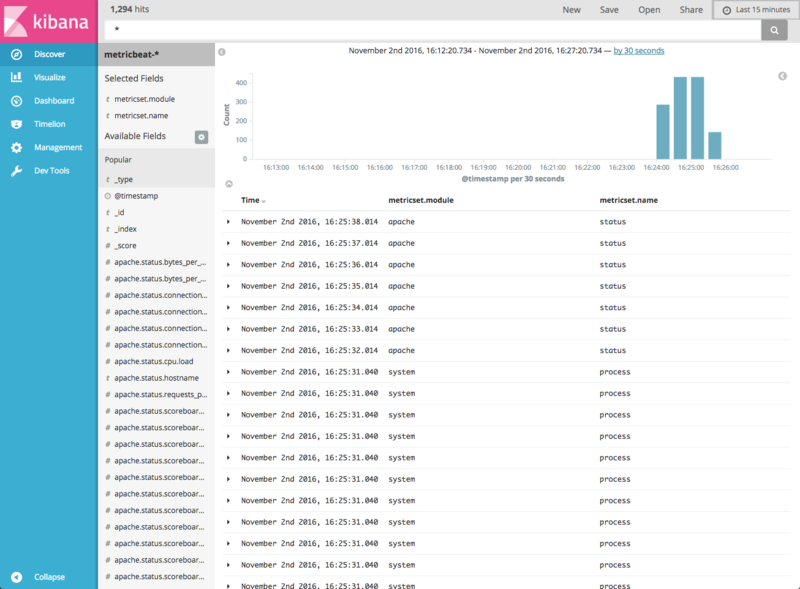 In the Modules configuration section, you define which system metrics and which service you want to track. Each module collects various metricsets from different services (e.g. Apache, MySQL). These modules and their corresponding metricsets need to be defined separately. 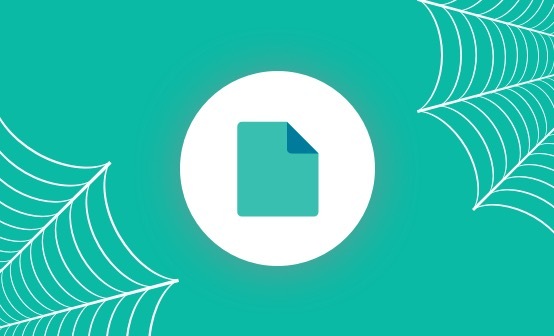 Take a look at the supported modules here. By default, Metricbeat is configured to use the system module which collects server metrics, such as CPU and memory usage, network IO stats, and so on. In my case, I’m going to uncomment some of the metrics commented out in the system module, and add the apache module for tracking my web server. Next, you’ll need to configure the output, or in other words where you’d like to send all the data. 2016/11/02 11:38:35.030741 outputs.go:106: INFO Activated elasticsearch as output plugin. Our last and final step is to understand how to analyze and visualize the data to be able to extract some insight from the logged metrics. To do this, we first need to define a new index pattern for the Metricbeat data. Select @timestamp as the time-field name and create the new index pattern. Opening the Discover page, you should see all the Metricbeat data being collected and indexed. If you recall, we are monitoring two types of metrics: system metrics and Apache metrics. To be able to differentiate between the two streams of data, a good place to start is by adding some fields to the logging display area. Start by adding the “metricset.module” and “metricset.name” fields. 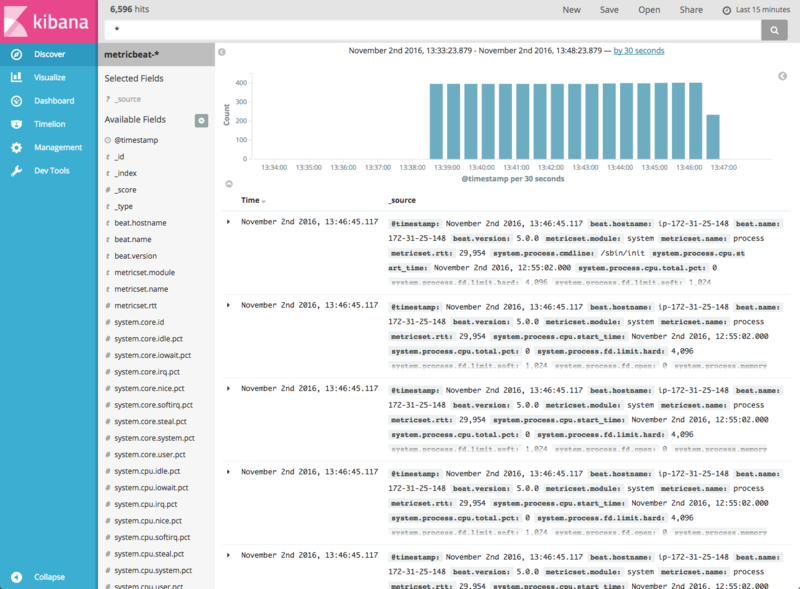 Kibana is notorious for its visualization capabilities. As an example, let’s create a simple visualization that displays CPU usage over time. To do this, open the Visualize page and select the Line Chart visualization type. Now, luckily for us Elastic created an easy way to get started with building visualizations of the data by providing us with a way to download a Metricbeat dashboard. 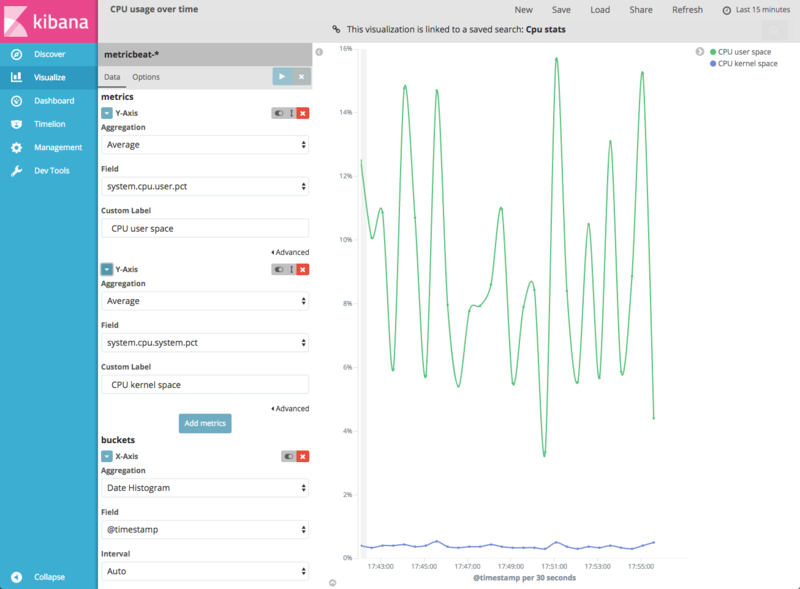 This will save us the time of figuring out how to build visualizations, a task that can be fun but can also consume quite a lot of time if you’re new to Kibana. Note: If you’re using Logz.io, you’ll find a pre-made Metricbeat dashboard in ELK Apps — our library of pre-made visualizations, dashboards, alerts and searches for various data types. After the script downloads all the dashboards, all you have to do is open up the Dashboard page, select Open, and select which dashboard you’d like to use. Playing around with new technology in a sandbox environment is always fun and worry-free. Deploying in production is an entirely different ball game, and it’s no wonder we meet ELK users still using Elasticsearch 1.x. Still, Elastic Stack 5.0 is a major improvement from the previous version, both from a user experience perspective and a performance/stability perspective.